﻿Texas A&M University-Texarkana anticipates offering the courses as indicated in the schedule of classes. Classes are subject to change at any time. Any course may be withdrawn from the current listing if the enrollment is too small to justify conducting the course or as a result of a reduction in funding. Room assignments that appear on the confirmation of class enrollments that are received during registration are tentative. Students should always check Web for Students for updated room assignments at the beginning of each semester for final classroom assignments. 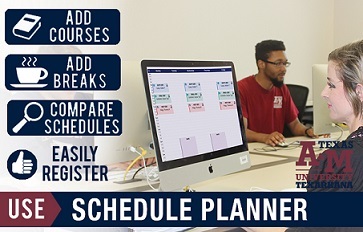 Find the perfect schedule using the new web-based schedule planning tool, Schedule Planner. The Schedule Planner can help you create an ideal schedule to meet your needs. Click on the image below or visit the Schedule Planner website for additional information. DegreeWorks is your Academic GPS to navigate your way to graduation successfully. Click the image below to visit the DegreeWorks website for additional information. To view previous class schedules, please visit the Archived Class Schedule website.